I say all this because I am a rules person that likes to have a pretty game in front of me. To me fluff is a tertiary aspect to my games (Star Wars being an exception), which is a good job because Runewars is a fantastic rules system, backed up with serviceable miniatures—with some quite stunning focal miniature sculpts—but has a background more generic than a 1970’s Tolkien rip-off. 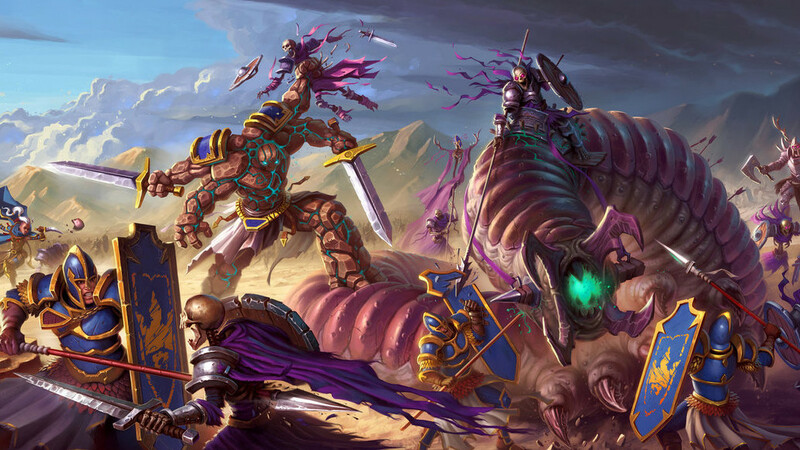 Runewars sees Fantasy Flight Games fully embrace the table top miniatures hobby. 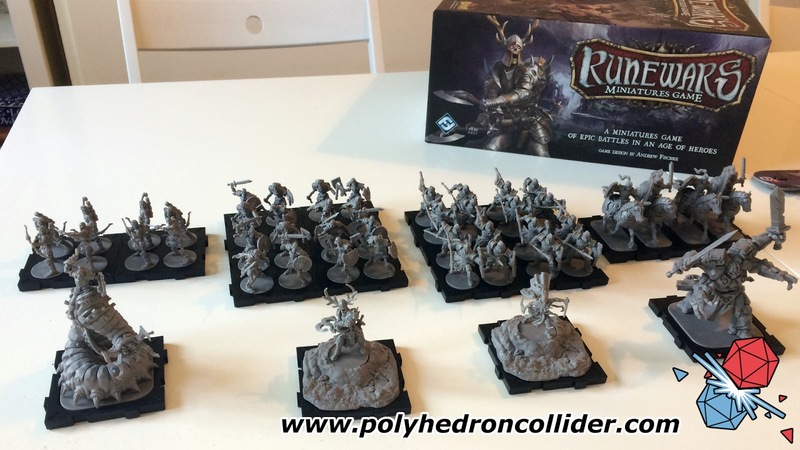 Unlike X-Wing and Armada, with Runewars you are expected to assemble and paint your miniatures. And some of these miniatures (I’m looking at you skeleton archers) are more than a little fiddly to put together. 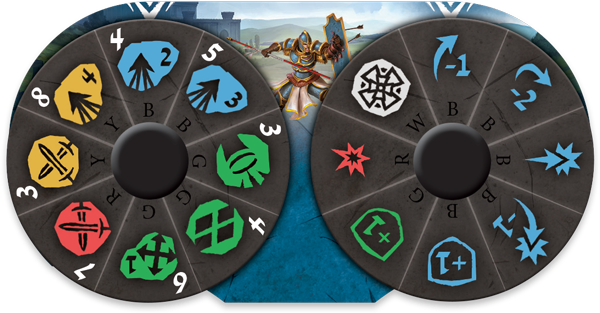 It’s not a Fantasy Flight Game without the assembly of dials, and it is these dials that turn Runewars from a generic rank and file miniatures game into something very special. Each unit has its own unique dial, with a dial for the units order and a second dial for a special effect or bonus. At the beginning of each turn players secretly select the order and bonus they want to execute. It could be a manoeuvre, an attack or an effect, such as rally. Because you are selecting these orders at the beginning of the round, it has a huge effect on how Runewars plays compared to more traditional miniatures games like Warmachine or Warhammer. You have to consider where you opponent is going to be and anticipate their actions, rather than the perfect information that typically resides in the traditional I-go-you-go game. It makes for some really interesting situations. A perfect example is when two units were in facing off, both just within charging distance of the other. In a more traditional game, the player whose turn it was would just charge in, getting the bonus and hopefully doing more damage. But here we have two units, both of which can charge, but if one player had charged first the second player might not even be able to attack. Each order also has an initiative order, and so timing is crucial; do you select to attack, on the basis that your enemy will have charged you and be engaged, charge yourself, or move backwards, hoping to get out of charge range and force your opponent to run into the open causing panic. In our example both sides shuffled backwards, assuming the other would charge, resulting in a bizarre standoff where both armies just stood and glared at each other for a round. This simple concept sets the dynamics of the game, and means that Runewars is all about anticipating your opponent’s actions. If you have played X-Wing then it feels both familiar and fresh. Runewars may still use X-Wing's manoeuvre templates, meaning that positioning on the battlefield is millimetre accurate, but by mixing up the attacks and movement into a single choice extrapolates your options by an order of magnitude. Combat is also simple but works well, and is a case of just rolling the dice from your unit's stat cards. Of course its Fantasy Flight Games so we are dealing with bespoke dice with lots of weird symbols. What is interesting is the same dice are rolled no matter the size of the unit, the amount of damage inflicted is based on the width of the regiment and further ranks allow you to re-roll dice. There are also surges, something any Descent player should be familiar with, which you can spend to activate a unit’s special ability. Also on these dice is the concept of panic. When attacking you can spend panic symbols, as well as panic tokens, to draw panic cards to play on your opponent’s unit. Similar to critical damage in X-Wing, these have some really interesting effects and the ability to choose when to spend your tokens, or which cards to play, make them another interesting tactical decision. As this is a rank and file game you will be removing casualties from the trays as you play, and them removing trays as they empty. This unfortunately is one of my major criticisms when it comes to Runewars’ components, as trying to remove an empty tray, without moving the entire unit is near impossible. In tournaments I can see this requiring your opponent to hold down the unit while you attempt to prize the tray up. So from a rules and gameplay perspective, I am very happy with Runewars. It takes X-Wing's dynamic movement a step further, making it more intricate but not bogging it down with too much complexity, but as mentioned earlier this is just one side of the dice. 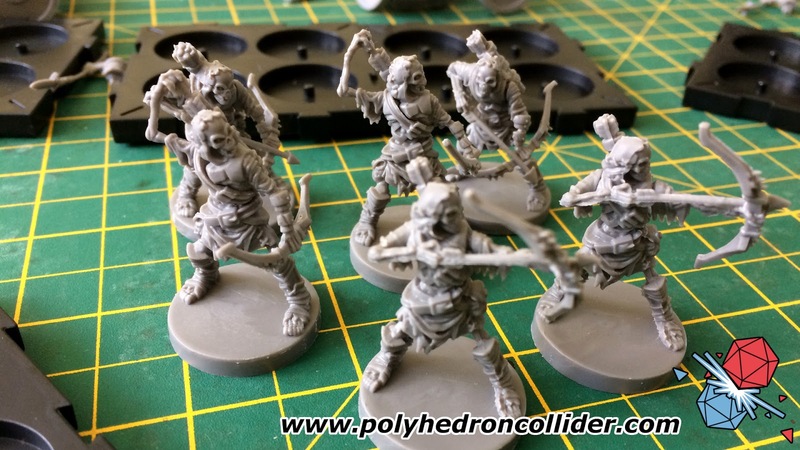 Runewars miniatures are nicely made and the softer plastic certainly is hard wearing. Assembly was a little tricky in places, but certainly a lot more straightforward than Warmachine and Hordes which we reviewed many moons ago. As for the quality of the sculpts, that's something you really need to decide for yourself, beauty is in the eye of the beholder after all. Personally, I find the miniatures serviceable and the range of poses enough to make them varied and interesting on the battlefield but I think the carrion rider is one of the nicest looking miniatures I have seen in a long time and can't wait to paint it. There’s no doubting that the Core Set is packed with miniatures¬—and one would very much hope so with an RRP of near £100—but for the game as a whole it definitely feels you are paying just enough for the contents. Compared to other core sets like Warhammer 40,000, Age of Sigmar and Warmachine / Hordes it feel that you aren’t getting as much plastic for your money but you are getting dice, templates, dials and cards, as well as thick card stock terrain tiles. But then the Fantasy Flight Games core set issue rears its ugly head yet again. It's an old problem and I am in danger of sounding like a stuck record, but the Runewars core set represents only half of what you need to play a full sized game. A standard Runewars game is 200 points and you'll be able to pool together around 100 points per side from the core set. This isn't a new problem, Warmachine and Hordes starter sets need considerable investment to bring them up to tournament level games but at the same time Warmahordes has a significantly cheaper entry cost, and the changing of a single unit can completely alter your game. All in all you are probably looking at a £200 to £300 investment to bring Runewars up to a standard game, depending upon how much choice you want. And no matter how much I love the ruleset, this is why I am worried about the future of Runewars. 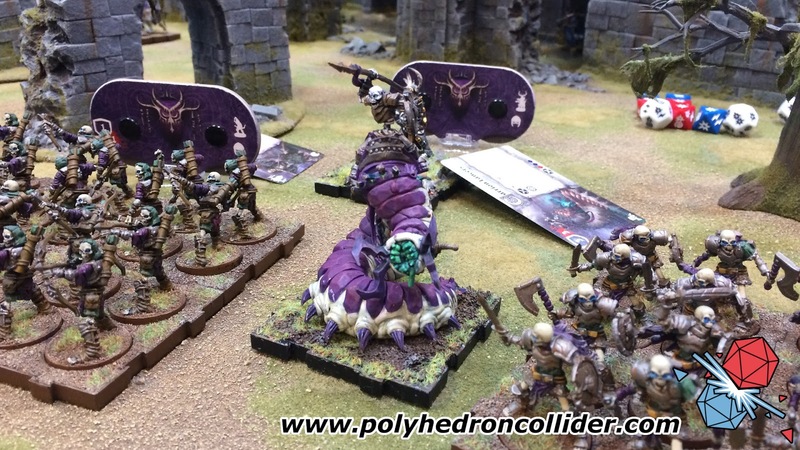 While it is true that every miniatures game needs expanding, most games of this ilk ease you into this realisation, either by leaving the concept of a standard game vague and undefined, or by drip feeding the rules and miniatures in the starter box and suggesting simple ways in which you can expand the game further. Runewars however, just teaches you the rules and then says; to play a proper game you're going to need twice as many miniatures as you currently have. I understand why Fantasy Flight Games have taken this direction. It's all based upon the future support of the tournament scene, and judging by the near constant X-wing tournaments in my local area and the absolutely huge tournament room at this year’s UK Games Expo, it's plain to see how fantasy Flight Game plan to support the future of Runewars. But the brazenness of this approach has wound me up, telling players straight off that to play a normal game you will need to spend a lot more money and making no provision for smaller games in any of the rules. It has annoyed me so much because I really do like Runewars rule set, I love the dynamic gameplay that ignores years of ‘I-go-you-go’ tradition in place of something fresh and engaging. 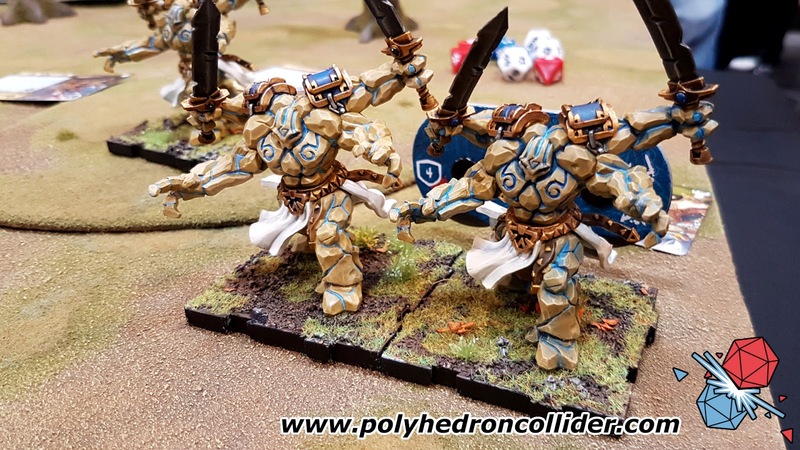 I love charging my stone golem across the battlefield or carefully eyeing up the charge distance of my cavalry, and although I haven't yet set paint to brush I know that the carrion rider is going to be a dream to paint. I just wish the barrier to entry wasn't so high. This review is based on a full retail copy of the game provided by the distributor.